For some, the office area is a space where a large portion of the day’s time is spent working diligently and productively earning your keep and providing for your loved ones. At Amish Furniture Factory, we feel that the office should be a place for you to worry about one thing only: getting stuff done. Furthermore, your office furniture should only contribute to accomplishing only one thing: getting stuff done. 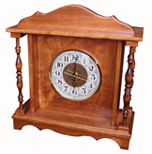 When you buy a solid wood Amish made desk, bookcase, or office chair, you will be buying office furniture that will you’re your productivity go up as a result of a heightened aesthetic appeal, and having zero time maintenance expenses to repair or replace cheap and poorly built office furniture. Quality and elegant Amish office furniture is what you want, and is what we have! 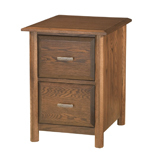 Finding solid wood office furniture that you find aesthetically pleasing is easy at Amish Furniture Factory. Every piece of office furniture we sell can be customized to some degree to suit your specific needs and tastes. We allow you to you choose what you want from our large list of options shown available for each piece of Amish office furniture we sell. Depending on the type of Amish office furniture you’re shopping for, the options will vary. Our Amish office chairs come available with the most plentiful option list. Most of our office chairs start life out looking (and are pictured) like a dining room chair with a stationary four legged base. This style of office chair can work equally well in an office environment, but lacks the feature of an office desk chair. Each office chair with a stationary base can be fitted with an office desk chair base with five legs that each has a caster wheel at the end. The bases can also be fit with a gas lift to adjust the chair height. Each office chair can then be customized with wood type stain color and upholstery type. The wood types most commonly available for our solid wood Amish office furniture, including our office chairs, desk chairs, bookcases, and others, are the most popular and in demand domestic hardwoods that are readily available in the United States. These woods include oak, brown maple, maple, cherry, hickory, and walnut. Each wood can be stained with multiple stain options to get the color just right. Our Amish office and desk chairs can be upholstered with any fabric, leather, or faux leather we sell, or that you provide. Also, don’t forget our other growling lines of office furniture including letter holders, file cabinets, bookends and clocks and calendars. No matter the piece of Amish office furniture you select, you will be buying pieces that will last you for decades and provide you with grand levels of elegance and aesthetics that will make you feel good and want to accomplish your daily, monthly, or lifetime goals!